Sew what's cooking with Joan! 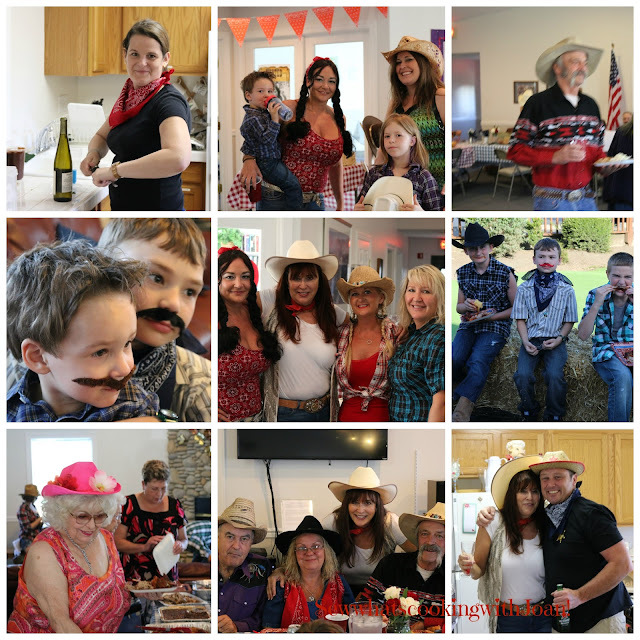 : How to create the perfect Western Themed party! 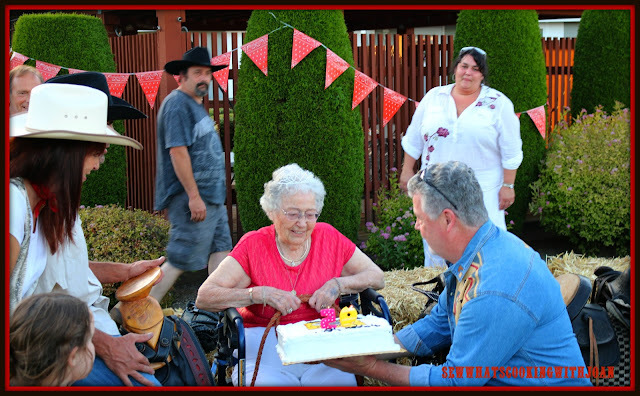 I recently hosted a 95th Birthday party for my Mother's birthday. 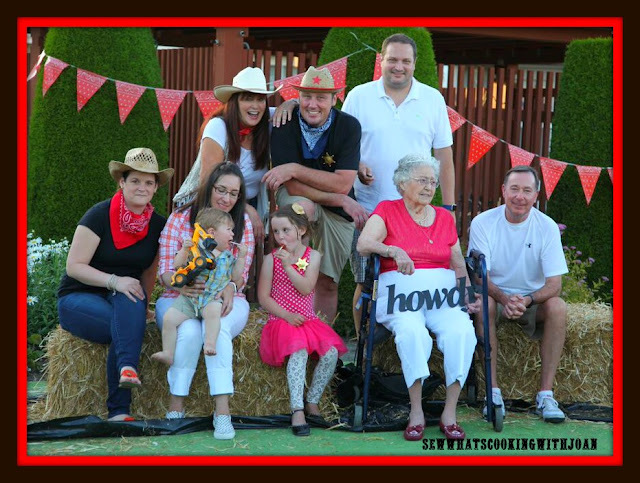 The family brained stormed for a theme and zeroed in on a western theme. Volunteers for set up and/or break down, please sign up here. If we have 6+ for set up we should be able to get it done in 1 1/2 hours or less so 3:30 PM approximately. 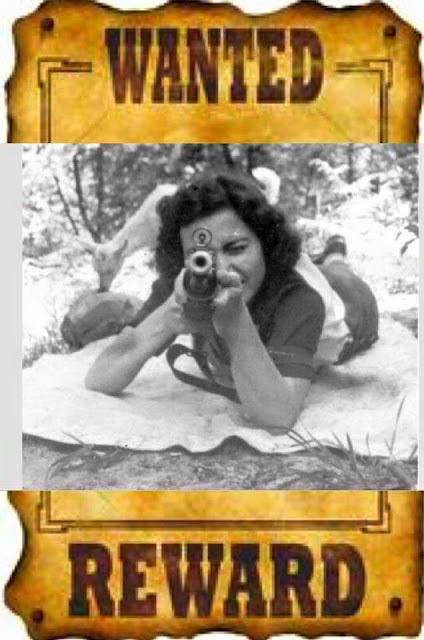 Eva could you confirm with Carolina Smoke. They have address and delivery time. Everything is confirmed with Carolina Smoke for 5:30 PM. 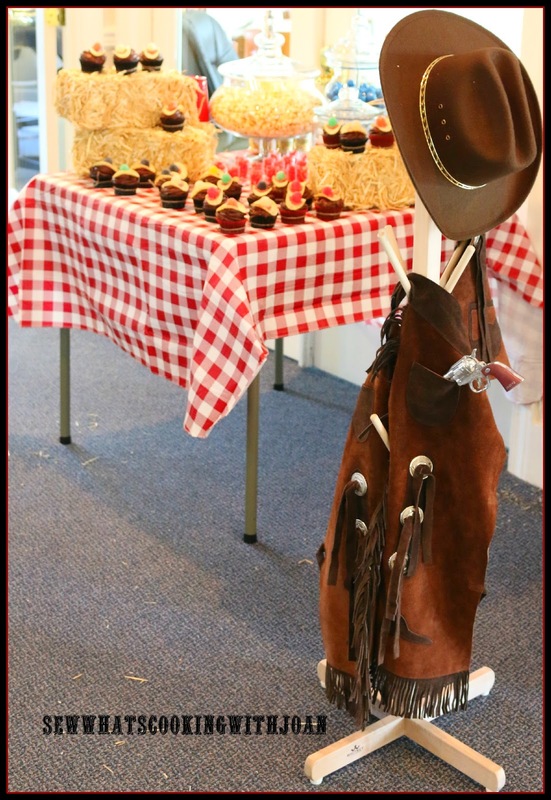 Decorations for a cowboy or western theme are easier to find than you may think! I grew up on a farm/ranch, broke my horse for 4 H and know a lot about the whole cowboy experience. Not only that, but, my brother's are still involved in horses, as are some of their children. 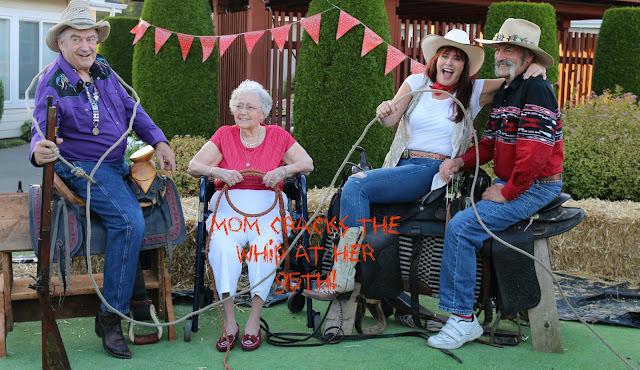 We have lot's of cowboys and cowgirls! I still have my saddle, bridle, blanket, spurs and everyday riding boots! However, I have moved on to a more relaxed lifestyle. It is a lot of work to have acreage and animals, so, I guess you can call me retired from not only work, but, the ranch life and all the work that comes with it! If you don't have access to all the authentic western gear, you can buy bales of straw at a feed store, mini bales at Michael's or Hobby Lobby. The little plastic boots came from Oriental Trading on line. The link will take you right to the western theme party items. I bought cowboy hats, banners, sheriff badges, mustaches and a few other items from them. 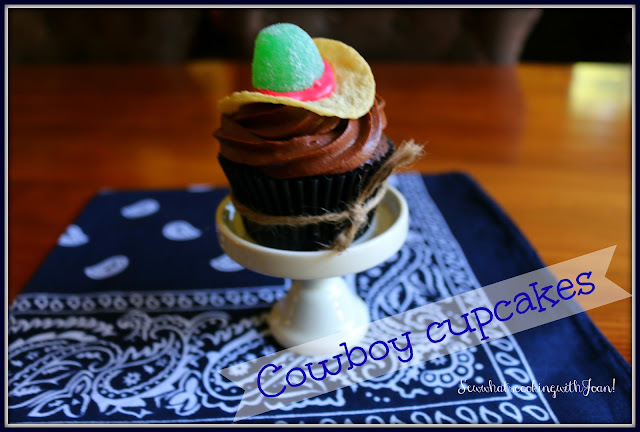 Doesn't this cute "Cowboy Cupcake" just set the mood of this fun party!! 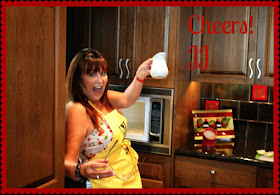 Easy to make just click on the link to find out how!! The fun handkerchief I bought at Oriental Trading Company. 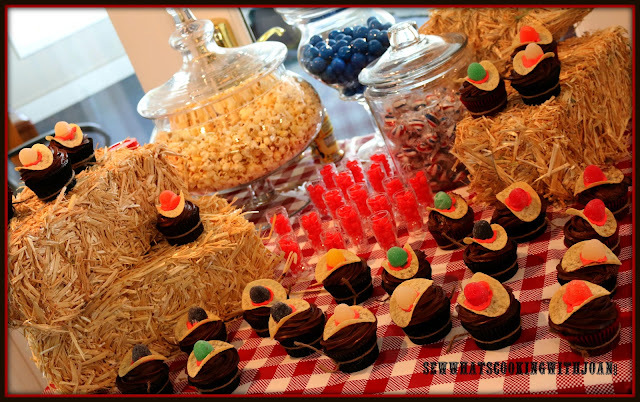 A fun candy/popcorn bar will add interest to the party and everyone will remember it! 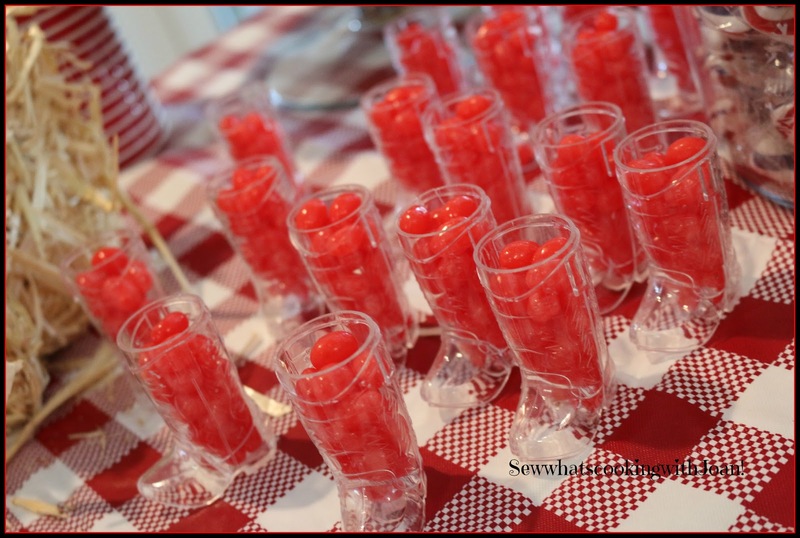 Fun Mini Boot glasses filled with jelly beans! Everyone at one point or another has wanted to be a cowboy or cowgirl and you can create the atmosphere just like out of the old western movies! I incorporated bales of straw, rope, and cowboy gear like hats, sheriff's badges, horse shoes, etc. throughout your party space. For the western party I styled, with the help of family I created seated table's, buffet dinner table, cake table, gift table and a candy/popcorn/cupcake table using these concepts, and a color scheme that stayed consistent throughout the entertainment area inside and out. I had this party catered by Carolina Smoke in Bothell, Washington, because of the size, 50+ family and friends. The food was delicious and consisted of baby back ribs, BBQ chicken, hot wings, brisket, pulled pork, baked beans, two different corn breads (sweet and savory) and potato salad! 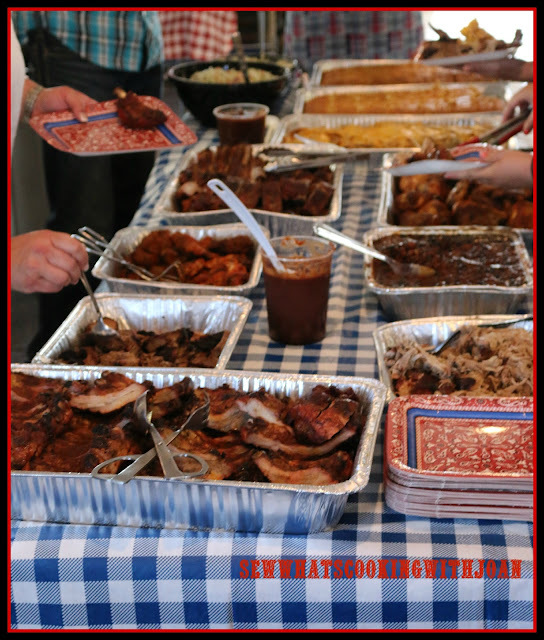 It was a cowboy feast! Using paper banners, cans, checkered table clothes and handkerchief's in your party decor is a great way to "brand" your party and tie everything together. 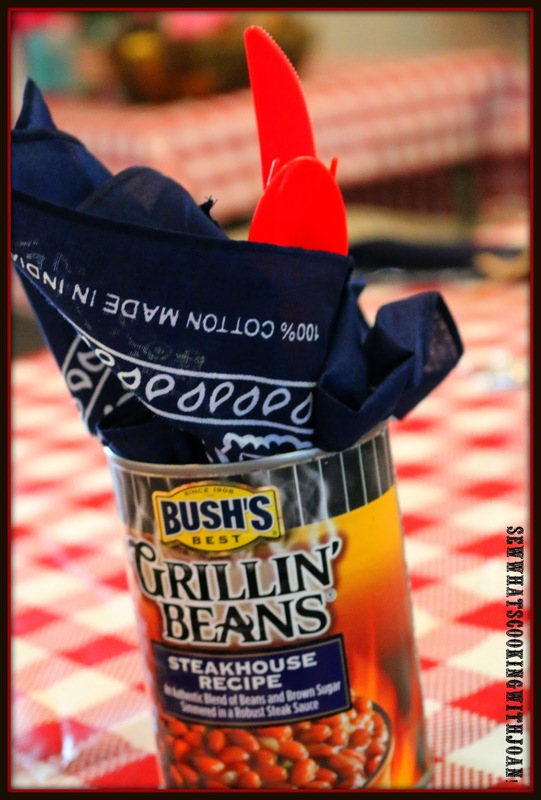 Here I used up-cycled cans to hold the napkin and plastic ware and placed them on the tables. 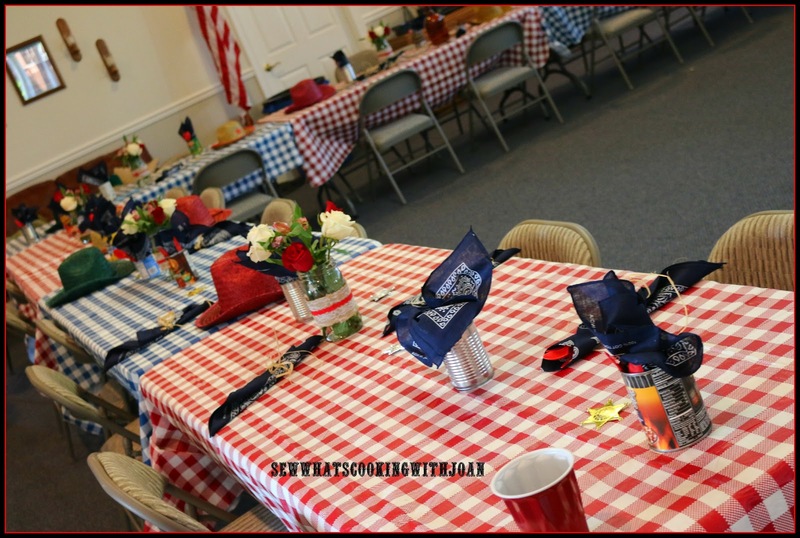 Place settings are fit for cowboys, cowgirls and little buckaroos! We had 50+ people at this party, so we had a handkerchief themed paper plate for dinner. 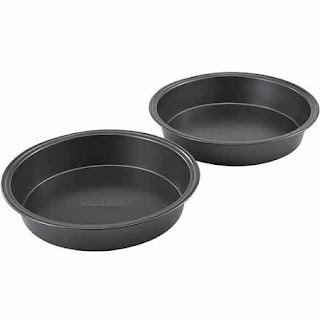 However, if you have a smaller crowd, I would use a round tin cake pan, similar to what was used around the campfire in the wild west! You can pick up these cake pans at the dollar store for $1.00!! Then reuse at a later date for a triple layer cake! Little buckaroos would love this, they could bang their fork on the bottom of the pan...so cute! Another idea for plates for that western look is just foil pie plates. 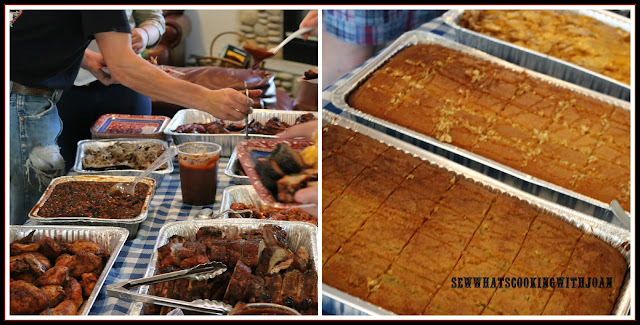 I had the party catered by Carolina Smoke who delivered everything in foil containers. Usually I would have them put the food in decorative platters and bowls, however, I feel the foil containers adds that "western feel" and is easy for clean up. Bandanas can be used as napkins. 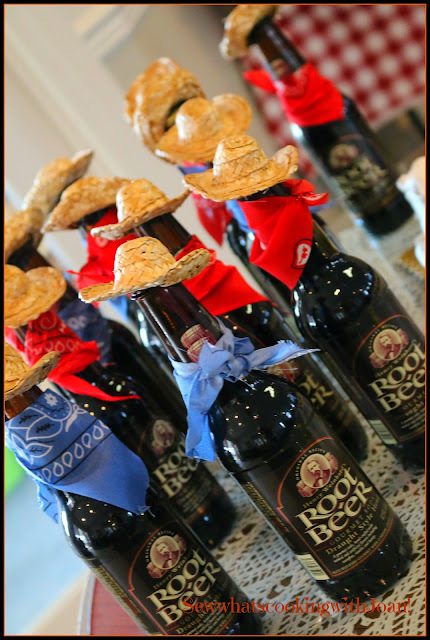 Dress up root beer bottles and add a little whimsy at the same time. I found mini cowboy hats in the "doll making" section of the craft store (Hobby Lobby). They fit perfectly on top of the bottles, and adding a mini "bandana" around the bottle neck has them resembling cowboys. The kids loved this and begged for a root beer cowboy to take home! I provided both red solo cups and plastic boot stemmed wine glasses, keeping with the theme. 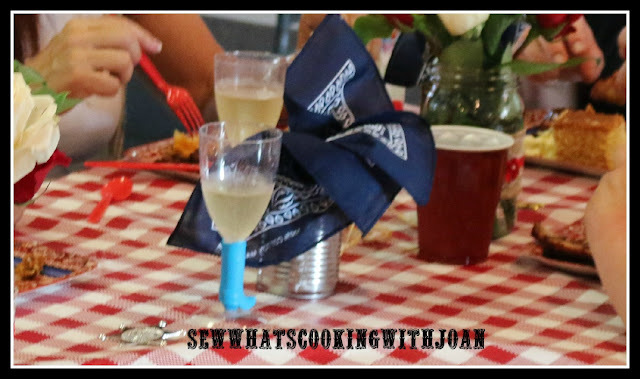 Another idea, if you are hosting a smaller party is to simply tie raffia around the stem or body of the drinking glass...you could even add a little plastic cowboy charm, so that the guest knows which glass is his/hers. Amy making the cowboy cup cakes with me a day before the party. Dustin helping with the decorations, The beginning stages of decorating. Beautiful flower arrangements in twine wrapped mason jars were made by my niece Sarah. I had this costume tree in our grand children's play room. I took all the other costumes off and made it a cowboy coat rack! The cake table and cake...keeping with the theme. My daughter-in-law, Amy ordered the cake from Safeway. The western theme was embraced by all who attended the party. 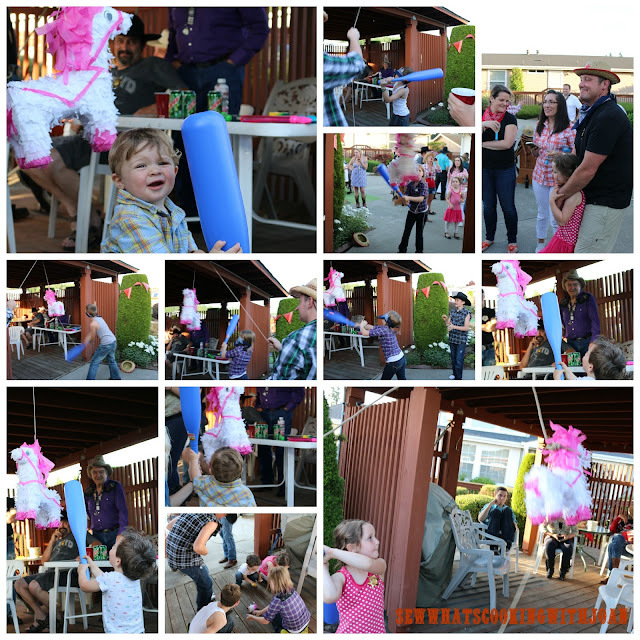 Of course I wanted our little buckaroos and Annie Oakley's to have plenty to do, so one of the activities was a fun horsy pinata filled with yummy candies! The adult's enjoyed watching this fun activity as much as the kids enjoyed doing it! 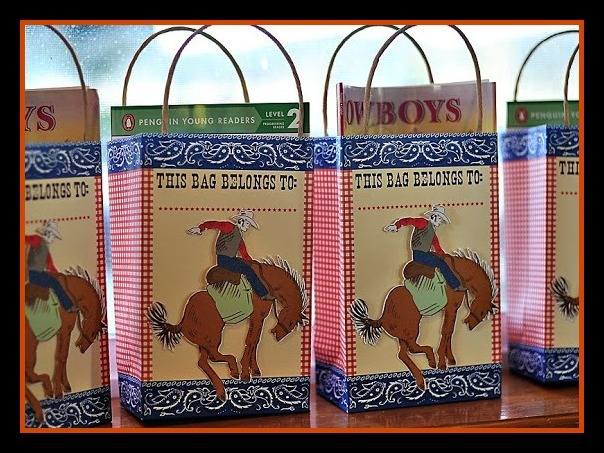 Fun "Loot bags" for little buckaroos! Find these bags made by Meri Meri on Amazon. Also, lots of cowboy themed small gifts, such as color crayons, books, necklaces etc on Amazon. I always try to take a group shot at the party so we can use them for Thank You notes or as memory photo's for guests or a memory album for the guest of honor… Of course with this monumental 95th Birthday party, we stepped it up! Everyone participated in bringing saddles, bridles, whips, spurs, straw bales, lasso and rope. 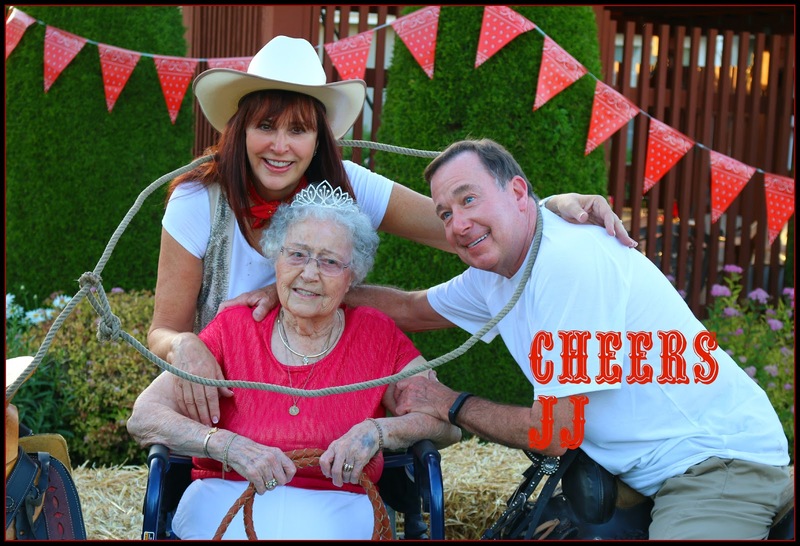 Our efforts paid off in some of the best Western group photo's I have ever seen! My son brought his camera and tripod. I organized the photo session by having the entire party in the picture first. the next group of photo's was just family, then we broke into individual families and some favorite groups. The guest of honor did not have to move, just sit and laugh at all the antics going on around her!! Hahaha! The photo session turned out to be a highlight of the party! Below are some of the photo's, however, hundreds were taken. Friends and family crazy pose photo! This fun photo is my two older brother's and I. Mom was thrilled! Isn't she beautiful! We are a lucky family, blessed with great gene's! To be honest your little guy or even a Grandma or Grandpa has a tiny cowboy on the inside, and this western themed party is a great idea! 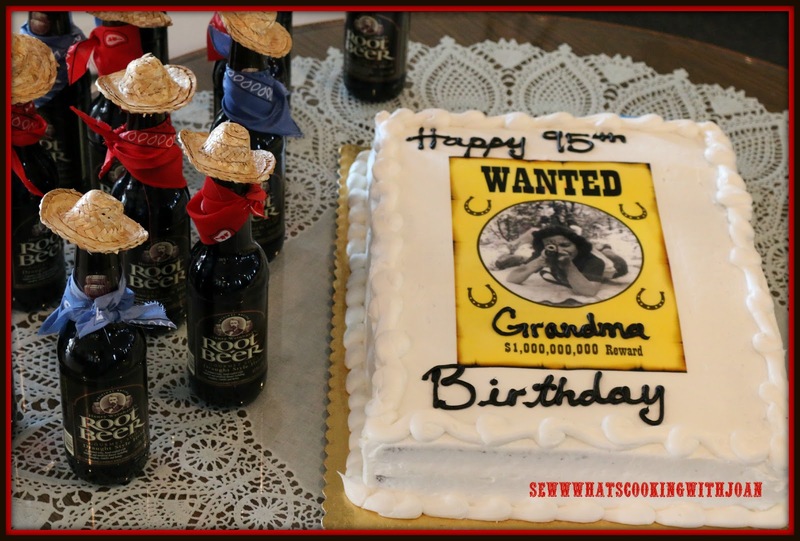 Decorated with cowboy inspired ideas like bunches of straw, cowboy hats, ropes, sheriff’s badges and more, your party space will look like it's straight out of an old country western movie set! !